The dark clouds and slight drizzle forced the Lawson Tama lights to come on for the game to be completed but they had little impact on Hana who were determined throughout to rain on Koloale’s parade. While Hana was successful in the first half, there was too much in the Koloale arsenal and it was only a matter of time before they struck. Joses Nawo sealed the deal with an individual effort from the edge of the 18 yard box which found its way past the Hana goalie courtesy of some help from the wet surface. Koloale’s points haul now increases to a total of 35 and surely they are out of the reach of any of their opponents in the league. The second placed side in the competition sits on 28 points and can only reach a maximum of 31 points should they win their final game. Thus, the fairytale has ended positively for the men in green. Their final win in the league sums up a stunning performance for the former O-League finalists. Bagging a total of 11 wins and drawing 2 of their 14 games was the record that Koloale set this year and it will be a challenge for other clubs in the years to come. 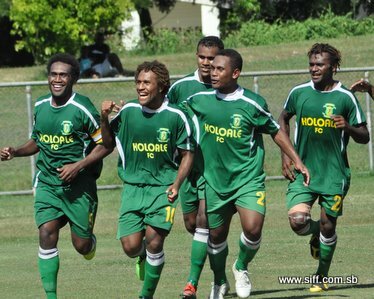 Opening the season with a 4 – 0 win over Hana, Koloale were pace setters all along despite getting it wrong on the one occasion against Solomon Warriors. Of course, Koloale’s advantage was that it played in the O-League and that the S-League started around the time that their performance in the regional club competition turned from worse to better. As Koloale gathered steam in O-League so did its performance in the S-League. Winning also means Koloale is halfway to the next O-League but the financial windfall of SBD$150 00 from the first prize will be the immediate thought in the minds of the team as they celebrate their achievement. The costs of participating in the S-League are herculean just as the prize money on offer for the top 3 finishers and club’s management will welcome the cheque with both hands. The foundation of Koloale’s success can be found in the development process invested by the club on players and by owner, Abraham Eke, in their own training ground the AE Oval. Koloale’s recruitment process netted former Waitakere United striker, Benjamin Totori, and also former Auckland City defender, George Suri. Hekari United duo, Henry Fa’arodo and Gideon Omokirio, joined Koloale after completing their O-League complements, cementing, a strong playing force. But this victory is also on the back of players like Shadrack Ramoni, Mostyn Beui, Jeffery Bule and Francis Lafai who have stood with the club for a number of years already. While the achievement is huge Koloale’s task to qualify for the O-League is not yet over. Winning the S-League league series is only one part of the process of qualifying for the O-League. Koloale has to make sure it wins the S-League Championship for direct entry or be forced into a playoff with the winner. This will surely be the target for the first champions of the Telekom S-League.